From Goodreads ~ Here is the complete history of the famous cove and the unique village that hosts thousands of visitors each year. The story begins with the formation of the rocks along these shores and the impact of the glaciers. The Mi'kmaq were the first to live here in the summers, harvesting the riches of the sea. A land grant in 1811 brought the first hardy settlers, who built homes and wharves and discovered that the sea could provide bounty but was also a source of great danger. 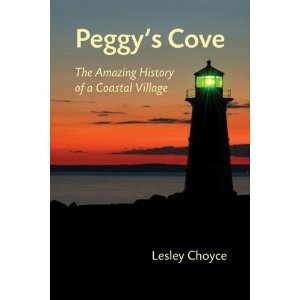 The story includes the origin of the name, Peggy's Cove, and details about the everyday life of nineteenth-century families living here. A history of the famous lighthouse is included and there are excerpts from many of the famous and not-so-famous visitors who have written about the Cove through two centuries. The author explores the most damaging storms and the shipwrecks, the reports of sea monsters and other strange phenomena. Fishing was always a source of income, but it changed over the years. At times the fish prices were so low it was not worth the effort and, in recent years, dramatic changes to the ocean have seen the collapse of several important species of fish. 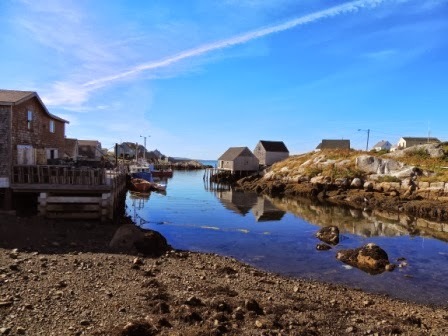 In the twentieth century, Peggy's Cove attracted artists, writers and ultimately thousands of tourists. Sculptor William de Garthe made his home here and created his monument to the coastal fishermen out of the sheer granite outcropping in his backyard. In 1998, Swissair Flight 111 crashed off the shores of Peggy's Cove and the community opened its doors to the world in an effort to provide support for the rescue workers and the families of the victims. From the earliest days to the present, the story of Peggy's Cove has been a tale of natural wonder and human endurance. 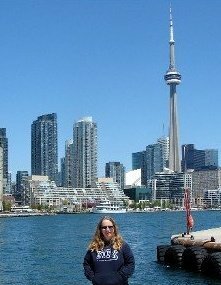 I'm originally from Nova Scotia and have been to Peggy's Cove many times over the years. This book caught my eye because I thought it would be interesting to learn more about it. The first chapter in the book is called "A Gift from Africa". Huh? Well, that caught my attention right away. Nearly 500 million years ago, in the other side of the Atlantic, deposits of sand and mud became compacted beneath the ocean and eventually helped form the coastline of the ancient continent of Gondwana. The sand and mud became compressed, forming shale and sandstone. 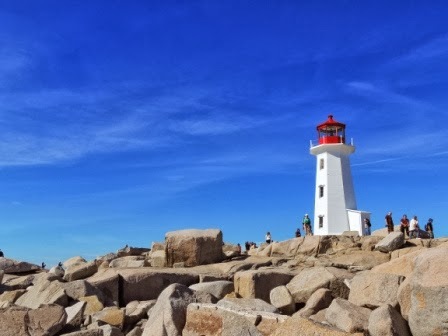 Then 100 million year later, a collision occurred and 50 million years later, Peggy's Cove was then near the equator and still recovering from the collision. After another 50 million years, Gondwana moved east and south and rock was dragged and dropped along the way, creating Nova Scotia. So what was left that jammed into North America was originally part of Africa. Interesting, eh? The author then continues to tell about the first families who lived and settled in Peggy's Cove, how it got its name, how it has grown and thrived throughout the years, the ups and downs of fishing industry, rum running, the lighthouse, deaths of people getting too close to the edge of the rocks, the SwissAir Flight 111 crash, how it has developed into the tourist destination it is today, and more. I liked the writing style. There was a lot of history and information provided but I didn't find it boring or too detailed. I read the digital version of this book and was surprised that the illustrations and pictures were removed. So if you are going to read this book, I recommend that you read a printed version as there are apparently pictures, etc. in it.